The blue-faced malkoha (Phaenicophaeus viridirostris) belongs to the family of cuckoos, roadrunners and malkohas, Cuculidae. The blue-faced malkoha species are distributed in India and Sri Lanka. These malkoha species are reported to be widespread through much of their range. These malkohas are monotypic species. The blue-faced malkoha (Phaenicophaeus viridirostris) is a medium-sized bird, measuring 40 cm in length and weighing 80 grams. The upperparts are dark greenish gray. The head is bluish gray. The wings are dark glossy bluish green. The throat, breast and belly are pale grayish green. The tail is long and graduated. The uppertail is dark green with white tips. The black eyes are surrounded by a large bluish patch. The bill is pale green. The feet are gray. Both the sexes are similar and the juveniles have dull plumage and barring of upperparts. 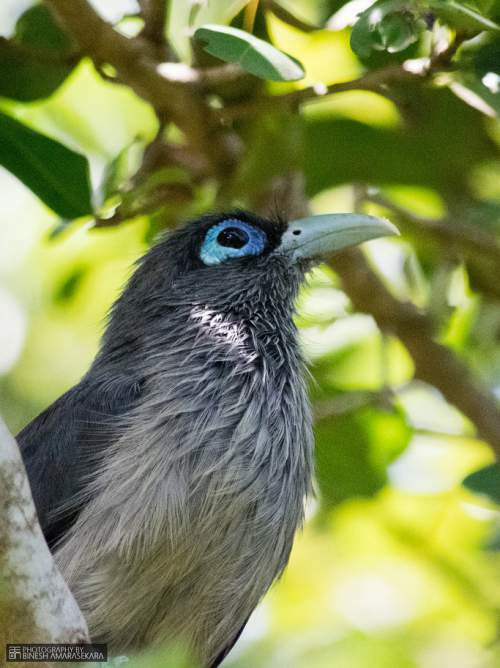 The blue-faced malkoha call is a croaking “kraa” sound. The blue-faced malkoha species are distributed in India and Sri Lanka. In India, these species are distributed in the states of Gujarat, Maharashtra, Madhya Pradesh, Odisha, Chhattisgarh, Telangana, Andhra Pradesh, Karnataka, Goa, Tamil Nadu and Kerala. 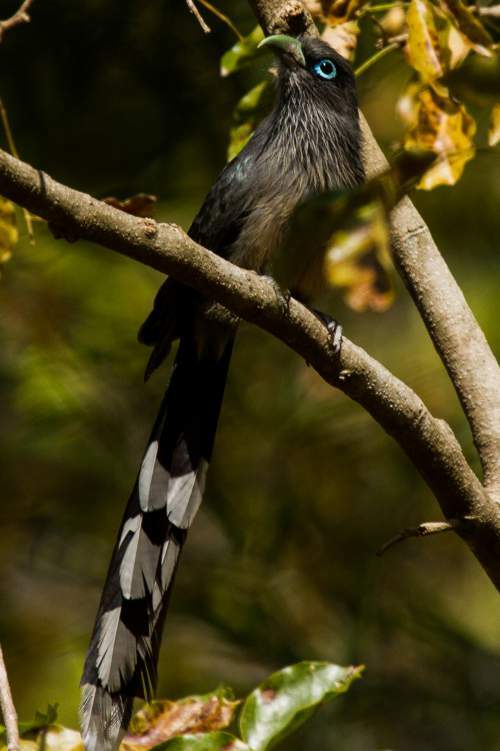 These blue-faced malkoha species have moderate forest dependence. These species normally occur in altitudes from 0 to 1000 meters. The natural ecosystems of these species include tropical and subtropical moist lowland forests, secondary forests, tropical and subtropical dry/moist shrublands, thorny scrubs and bushes and open forests. The diet of the blue-faced malkoha consists mainly of insects. A variety of insects like mantids, locusts, grasshoppers, cicadas, beetles, moths, termites and caterpillars are their primary food. These malkohas are mostly arboreal and occasionally they feed on the ground. They occasionally eat berries and drupes. These blue-faced malkoha species breed throughout the year, with a peak period from March to May. These birds are monogamous. Their nesting sites include thorny bushes and scrubs, up to two meters from the ground. The blue-faced malkoha nest is a bulky saucer made of twigs and rootlets. It is usually lined with green leaves. The typical clutch contains two eggs. The blue-faced malkoha species are non-migratory resident birds. The global population size of the blue-faced malkoha (Phaenicophaeus viridirostris) has not been quantified. The overall population trend of these species is reported to be stable. Throughout its range this species is reported to be common and widespread. The generation length is 4.2 years. Its distribution size is about 1,780,000 sq.km. 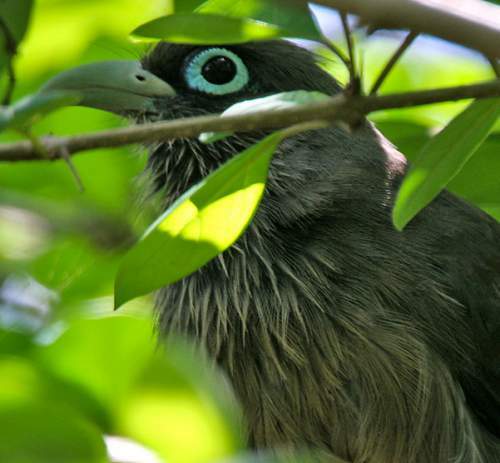 Habitat degradation and fragmentation is the main threat that may endanger the survival of these malkoha species. The blue-faced malkoha (Phaenicophaeus viridirostris) does not approach the thresholds for being Vulnerable, either under the range size criterion, or under the population trend criterion or under the population size criterion. The IUCN (International Union for Conservation of Nature) has categorized and evaluated the species and has listed it as of "Least Concern". The CITES (Convention on International Trade in Endangered Species of Wild Fauna and Flora) status is ‘Not Evaluated’ for blue-faced malkoha (Phaenicophaeus viridirostris). The blue-faced malkoha (Phaenicophaeus viridirostris) is closely related to black-bellied malkoha (Phaenicophaeus diardi), chestnut-bellied malkoha (Phaenicophaeus sumatranus) and green-billed malkoha (Phaenicophaeus tristis). Current topic in Birds of India: Blue-faced malkoha - Phaenicophaeus viridirostris.